This powerful add on will work straight out of the box but we've also made it easy to customise so that you can use your own html tags. You can change the heading to read what you like (e.g. 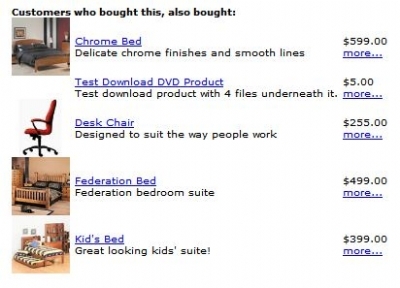 "Customers also bought...." or "People who bought this product also bought ...." etc. This feature controls how your products are extracted from your database. Any values that you select in this statement will automatically be available from within the body (point 3). You can add extra columns (e.g. product images etc), or you can change the ordering, or you can even change the matching-logic. 02 16-JUN-2005 Added cimageurl to sql and sample body content for thumbnails. 03 03-OCT-2006 Changed SQL Queries for MySQL Database types to cater for older versions which dont support order-by column names for grouped functions. 04 30-OCT-2006 Changed initial SQL Queries to not use cdescriptions as that is defined as a text field in SQLServer and so can not be sorted. Changed product loop to use a new/separate cursor for the body so that any product columns can be referenced without having to change the initial sql text. Took out cimageurl from the initial queries as its no longer need in initial queries. 05 13-AUG-2007 Upgraded BYZ038 (Licensing) module to cater for VP-ASP V6.5.